New entrance and plaza on Huntington Avenue rendering. Boston, MA – September 27, 2017 - Massachusetts College of Art and Design’s Board of Trustees has voted to move forward with the Bakalar & Paine Galleries renovation, with a slated groundbreaking date of June 2018. "As the only freestanding public college of art and design in the country we are committed to making an art and design education accessible to all," said President David P. Nelson. "With the revitalization of the Bakalar & Paine Galleries, one of MassArt’s largest classrooms and New England’s largest free contemporary art space, we can better fulfill our mission of welcoming the members of our community to experience, learn about, and enjoy the world of art and design with us." In May 2016, MassArt officially kicked off the public phase of UNBOUND: Campaign for the Bakalar & Paine Galleries with a $1 million gift from Pace Gallery founder and MassArt alumnus Arne Glimcher (BA’60, Painting). In June MassArt received a $225,000 grant from the Massachusetts Cultural Facilities Fund of the Massachusetts Cultural Council, and in September an anonymous donor gave a gift of $1.25 million to the campaign. To date, MassArt has raised $9.4 million towards the $12 million goal for the campaign. UNBOUND will fund a transformative revitalization of the 8,000 square foot, three-floor gallery space, which currently showcases four exhibitions per year by some of the world’s most influential, established and emerging contemporary artists. Campaign funds will support restoration and preservation within the historic galleries that occupy one of the original campus buildings. designLAB Architects and Dimeo Construction have been selected for the project. This summer, the College began Phase 1 of the project—renovation of the exterior plaza and the installation of an underground utilities system. 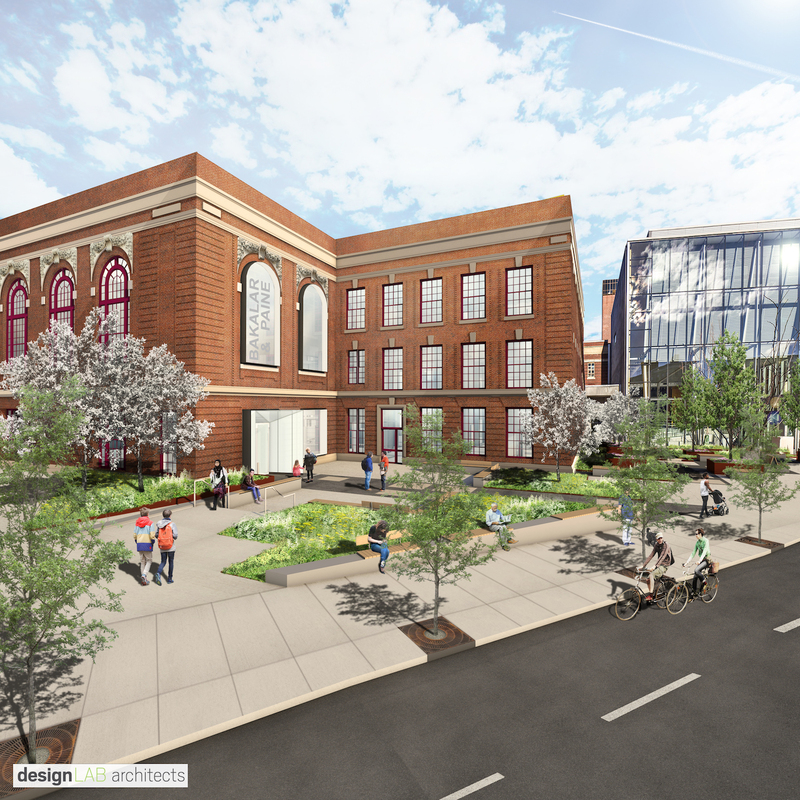 The landscape architecture will physically and aesthetically connects the 1,875 square foot plaza outside the Bakalar & Paine Galleries with the adjacent Design and Media Center plaza, completing the beautification of MassArt’s streetscape on Huntington Avenue. Revitalization of the Bakalar & Paine Galleries marks the final phase of the College’s $140 million comprehensive campaign launched in April 2010 for the transformation of the entire MassArt campus, which stands at the “top” of the Avenue of the Arts at Longwood Ave. and Huntington Ave. The Gold LEED Certified Kennedy building was renovated in 2008 and two new award-winning buildings were constructed, the Gold LEED Certified "Treehouse" residence hall (2012) and the Silver LEED Certified Design and Media Center (2016). A venue for national and international contemporary art, the Bakalar & Paine Galleries is MassArt’s professionally curated gallery space on campus, featuring thought-provoking exhibitions of work by the world’s most influential, established and emerging artists of our time. As the largest free contemporary art space in New England, the Bakalar & Paine Galleries is a vital cultural resource for the College, the Greater Boston area, and beyond. Exhibitions are curated to represent a variety of disciplines to serve as a teaching space for MassArt students as well as an inspirational, educational resource for the public. In addition to its exhibitions, the Galleries produce numerous free public programs throughout the year including Family Days, receptions, and lectures. Recent exhibitions have featured contemporary artists and designers such as Matthew Brandt, Felix Gonzales-Torres, Mona Hatoum, William Kentridge, Jim Lambie, Maya Lin, Zandra Rhodes and Alison Saar. In May 2016, MassArt officially kicked off the public phase of UNBOUND: Campaign for the Bakalar & Paine Galleries with a $1 million gift from Pace Gallery founder and MassArt alumnus Arne Glimcher (BA’60, Painting). To date, MassArt has raised $8.2 million towards the $12 million total for the project. UNBOUND will fund a transformative revitalization of the 8,000 square foot, three-floor gallery space. Campaign funds will support restoration and preservation within the historic galleries that occupy one of the original campus buildings. Renovations will allow for improved public access with a visible street-side front entrance on Huntington Avenue, new climate and relative humidity control systems that will allow for year-round programming, an elevator, new curatorial offices, a new gallery education room, an expanded preparatory workshop, and visitor amenities. designLAB Architects and Dimeo Construction have been selected for the project. Massachusetts College of Art and Design (MassArt) is one of the top colleges of its kind in the United States. Founded in 1873, MassArt has a legacy of leadership as the only freestanding public college of art and design in the country and the nation's first art school to grant a degree. The College offers a comprehensive range of undergraduate and graduate degrees in art, design, and art education, all taught by world-class faculty. MassArt is also home to the Bakalar & Paine Galleries, the largest free contemporary art space in New England, professionally curated to enrich the academic curriculum and make contemporary art an accessible experience for all. Among MassArt's most accomplished alumni are designer Brian Collins, art dealer Arne Glimcher, Oscar-winning set designer Nancy Haigh, visual artist and composer Christian Marclay, Project Runway Season 15 winner Erin Robertson, interior and lifestyle designer Kelly Wearstler, and photographer William Wegman. For more information, visit massart.edu. Follow MassArt on social media: Twitter, Instagram, Facebook, and LinkedIn.